Peter Beard was born in Southport, Lancashire in 1951. After studying industrial and furniture design from 1970 to 1973 at Ravensbourne College of Art in Chiselhurst, Kent, he spent a couple of years helping to set up a pottery in Scotland making domestic wares. In 1975 Peter Beard returned to Kent and opened his first studio in Harvest Bank Road near West Wickham Common. Here he started making the one-off sculptural pieces for which he is now famous. After twenty years in Kent Peter moved to Cubbington near Leamington Spa in Warwickshire and he has been there ever since. Peter Beard is a master of texture, making much use of wax-resist and a combination of glossy, semi-matt and matt oxidized glazes on stoneware. He creates richly coloured patterns resembling naturally occurring surfaces that might be seen through a telescope or a microscope. 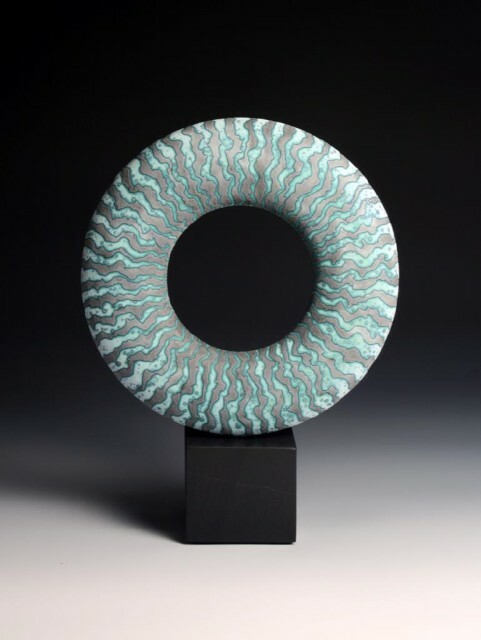 His forms are thrown and hand-built, often on a plinth in a complementary finish and colour. Peter's work is widely acclaimed and he has won many international awards. Examples of his work are to be found in numerous private and public collections around the world.